Finally a Weekly Wrap Up! For the first time in months, I managed to get a weekly wrap up done. We have had so many things going on and multiple deaths in the family that I could not manage putting together a wrap up. Never fear, lessons have been taking place. Simply put, I have been on automatic pilot for the past few months. The fog has started to lift this week. There have been some tough moments. There will be tough moments in the months to come but this week was different. This week we rediscovered our rhythm. We managed to get a substantial amount of work done. Measurable progress toward our goals was made. Logan even asked for some books to read next week like he was getting before we stopped lessons when Grampa got sick. We started the week on a high from finishing our first 5k. 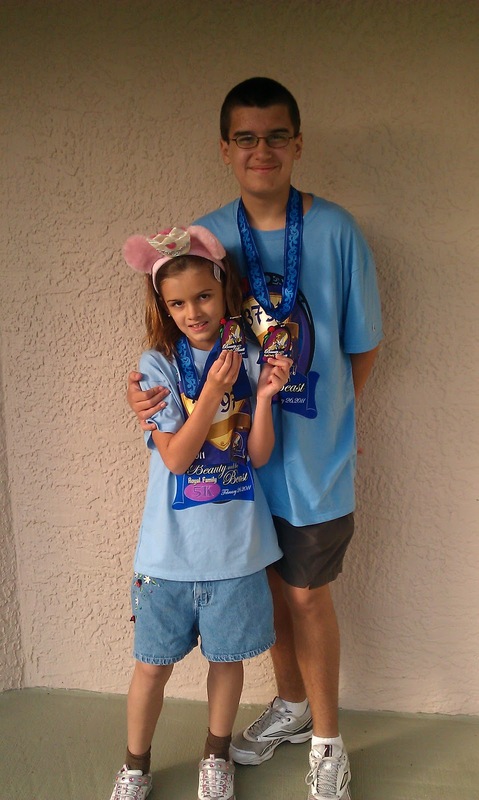 As a family, we ran the Royal Family 5K at Disney. It was a fun weekend. No worries. I have a blog post about it in the works. I managed to get lesson plans done early so schedules could be made. There was a slight hiccup Monday when I had to leave unexpectedly to drive my mom home because she was sick. We still managed to get our schedules done before dance. Mondays are our easy days since we have dance and horseback riding in the evening. Logan finished his math book last week. He had to wait until Wednesday this week to get his new one. He began as soon as it came in. Guess he likes math! He definitely doesn’t get that from me. I ordered Madison’s next math book at the same time although she is only half done. We use and love Singapore Math. We observed an orange tree for our nature study. Certainly, we must have looked completely crazy sitting on the sidewalk near our neighbor’s house looking at his trees. Lucky for us, it was Billy Joe. It was by far our best nature study ever. We sat in the warm Florida sunshine , smelled the sweet smell of the orange blossoms and watched the bees pollinate the flowers. It doesn’t get any better than that. 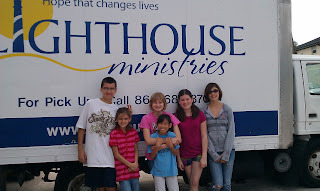 Our service project this week was helping out at our local homeless shelter’s. We sorted clothes for them to sell in their thrift store. Our local homeschool middle school group put this event together. We met new friends while having fun with old ones too. I would probably not do it again though. The woman in charge was quite rude to Logan to be honest. There is a plethora of volunteer opportunities in our area so that is not a problem. Well, that’s probably enough for this week. We did a lot more but I won’t bore you with the details. Hopefully our momentum will continue next week so I can do another wrap up! So sorry to hear about the deaths in your family. Glad you are getting back in the groove of things, but hope your family feels God’s peace through a tough time! How sad that somebody showing young people how to do service work did it with a snarl. I hope she treats the people she is serving better! It is maddening to watch your children step out of their comfort zone, help others purely for the sake of giving and have their efforts be met with unpleasantness. Sorry this happened to him. Hopefully she learned a lesson from this as well.